Commodity resins are plastics that are inexpensive, easy to process, and can be produced at high volumes. Many everyday industrial and consumer products use them due to their low cost. Most commodity plastics are used in disposable goods where mechanical properties and service environments are not critical. Commodity resins are the most readily available, and most thermoplastics fall under this category. 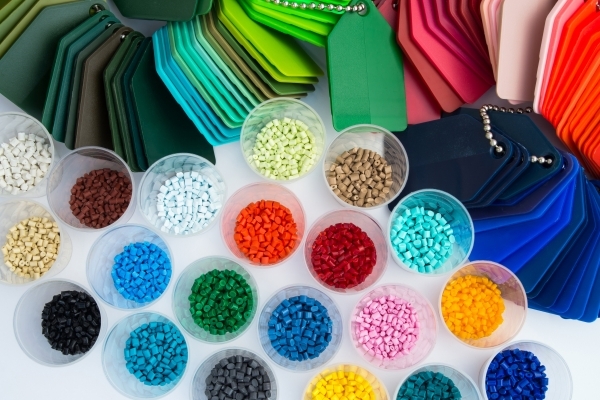 The majority of plastics used in thermoplastic injection molding are commodity resins. Virtually every industry has adapted to using commodity resins in their product lines. You can find these resins in products like film for packaging, clothing, food and beverage containers, as well as medical trays and printed materials. While commodity resins are readily available and easy to process, engineered resins are specialized for plastic injection molding production that requires better mechanical or thermal properties. These resins are products that must withstand harsh conditions, so they are strong and resistant to extreme temperatures, wear, and corrosives. Commodity resins are used for everyday consumer goods, but engineering resins have more focused uses. These plastics are typically used for molding in industries such as: military, aerospace, medical, pharmaceutical, automotive, and industrial. When choosing the commodity resin for your application, its helpful to understand each resin’s characteristics. Depending on your design requirements, certain resin properties can be more helpful than others. The majority of commodity resins are thermoplastics, and these have two types: amorphous and semi-crystalline. Amorphous plastics are usually clear plastics. They tend to have better dimensional stability and impact resistance, and they bond well with adhesives. They can be prone to stress cracking, however. Amorphous plastics are commodity resins like acrylic and ABS. Semi-crystalline plastics are typically not clear but have the more traditional look of plastic. They have better chemical resistance and electrical properties than amorphous plastics but can be difficult to thermoform. Commodity resins in the polyethylene family, like high density polyethylene, fall into this category. ABS: Acrylonitrile Butadiene Styrene is low-cost resin that provides many advantages. ABS is chemical resistant, flame retardant, and can be easily processed. It is commonly used in consumer goods like auto interiors and toys. Acrylic: PMMA is a medium cost resin that provides good weatherability and insulation. It can be clear but can also have color added to it. Acrylic is commonly used as a glass replacement for lenses, casings, and aquariums. High Density Poly Ethylene: HDPE is a low-cost commodity resin that provides excellent material flow. It is food contact acceptable and easily processed but has some trouble with weather resistance. You will commonly find HDPE in toys or buckets. Polypropylene: PP is a versatile material that provides excellent chemical resistance and is easily processed. Polypropylene is also food contact acceptable and is found in living hinges, packaging for consumer products, and plastic parts for the automotive industry. Polyethylene: PE lightweight, highly flexible thermoplastic with excellent resistance to shrinkage. One of the most commonly used materials, it is used in injection molding for manufacturing crates, dustbins, food boxes, and many more products. Polystyrene: PS is a versatile plastic that is used in a variety of consumer products. It is food contact acceptable and flame retardant. Polystyrene is often used in products requiring clarity, such as food packaging, product casings, and laboratory ware. PVC: Polyvinyl Chloride is economical and versatile. It can be soft and flexible, or more rigid as you see in industrial pipes. PVC has many uses in the construction, healthcare, and automotive industries, as well as many others. It is commonly found in siding, wiring, and packaging, as well as in IV bags and medical tubing. Styrene: Styrene is a commodity resin that provides good weatherability, processability, and high clarity. It is found in many products including food containers, appliance housings, building insulation, tub enclosures, and car body panels. Lomont is a leader in the plastic industry, specializing in various kinds of plastic molding. We are dedicated to providing the highest quality products and services for our customers. If you have any questions, please contact us. Let our experts help you find the right material for your molding applications.